Tangkulaelectric winch can be used in most occasion: SUV, truck, auto or other specialautos. It is a good helper when your car is in danger in desert, marsh,snowfield or other poor roads. And the winch can also used for rescue, clear barriers,or drag heavy items. But the installation and operation is easy and don't worryabout maintenance. 9500LBS pull capacity will satisfy most demands. If you areoutdoor enthusiast, welcome to buy one! You will love it. 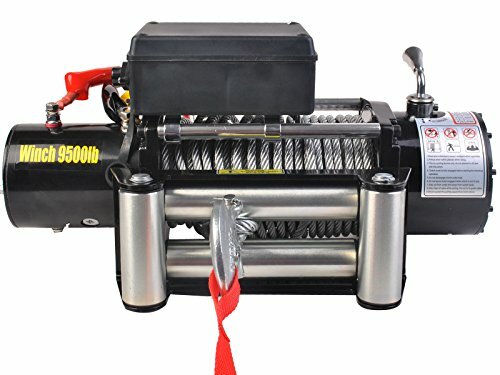 ✔The electric winch offers capacity of 9500 lbs of single line rated pull. It will be great helper during cross-country. And when the winch works, 4 Way roller fairlead to guide the rope onto the drum evenly. ✔4.0kw Motor ensures the car or SUV works well even with died engine. The winch equipped with efficient three-stage planetary gear train, which will offer powerful horsepower. ✔The winch comes with 12ft cable switch and cordless remote controller. The cordless remote controller can control power in and power out. And range of remote switch is 98ft. ✔When you stop the switch, it will lock the wire rope and stop pulling since automatic braking system. Operation is easy to control. ✔The winch is compact and easy to install. It can be mounted in horizontal or vertical plane using 4 point mounting system. Through the easy formula: gross vehicle weight * 1.5 = minimum winch size, you will get the right size.